7 July 2013 – Destination Beaufort, NC and rendezvous with Daniel. After several days of rain, the weather cleared up over the Independence Day weekend. The southeast (down east) was blessed with beautiful weather (low humidity, cool temperatures, and sunny sky). I had to work and couldn’t get away until Friday night. On the 7th July, we were going to rendezvous with my son Daniel in Beaufort, NC. Michele had to be back at work on Monday. It is lousy having difference holiday schedules. My son Daniel was going to drive down to Beaufort and Michele was going to drive back home. Daniel and I was going to anchor out on Taylor Creek for few days before heading home on Wednesday (that was the plan). The weather forecast was calling to average temperatures, with wind coming out of the southwest 10 to 15 knots. My only concern was the water level at Whittaker Creek. A southwest wind tend to push the water at the lower end of Pamlico Sound to the north end (toward Manteo). We got underway any way at 09:00 AM (Sunday, 7 July 2013). High tide in Beaufort was at 08:30 AM and low tide around 13:45. Therefore, we should be riding the currents out from Adams Creek to Beaufort. Beaufort, NC is 24 miles and at 5 knots it should take us at least 5 hours. Daniel was going to leave Raleigh, NC around 09:00 AM. It takes approximately 4 hours to drive to Beaufort from Raleigh to rendezvous with us (that was the plan). At 10:00, we arrived at 1 “AC” (the entrance to Adams Creek). We checked our iPhone app, and Daniel was still at home. 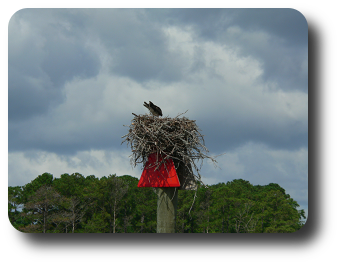 At 10:36, we pass some Osprey hanging out on Channel Marker No. # 6. We checked our iPhone app again, and Daniel was still at home. We decided to stick to the plan and call Daniel at 11:00 AM. We reach Channel marker No. # 10 at 10:50. We checked the iPhone app again and Daniel was still at home. Michele and I decided to turn around and head back home. We called Daniel and he was just getting up. He wasn’t going to leave until noon, which meant Michele wouldn’t get home until 19:00. I wasn’t having a son drive for 4 hours while tired or Michele. We turned around and headed home. We made good time heading back to Whittaker Creek. We had a 10 knots wind at our backs. We were able to motor-sail all the way home at 2400 rpm (making 5.3 knots). Heads toward Adams Creek and down the ICW toward Beaufort the wind was against us. We were averaging 4.7 knots at 2800 rpm. We moored at Whittaker Creek at 12:30. Over all, it was a nice day. I was able to spend two days with my lovely wife. July 21, 2013 in Sailing.